Originally published in November, 2002 issue of SKI Magazine. For four decades I traveled more than 100,000 miles a year with two cans of film under my arm, a tape recorder and a suitcase full of dirty laundry. I did as many as 106 live narrations each fall and winter in as many as 106 different cities. 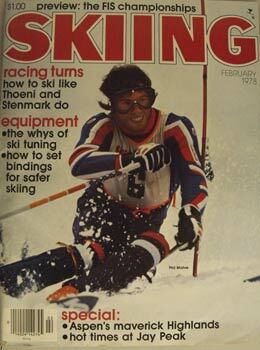 Warren hasn&apos;t always filled the house with raving ski fans. For those four decades the routine was pretty much the same. I would get a wake-up call at 5:30 a.m. and either grab a taxi to the airport, walk to the bus depot or drive my car to the next town for the next show. Sometimes the trip between shows would be an hour or two; sometimes it would be clear across America, from Los Angeles to Boston on the red-eye. I always tried to arrive at the theater at least an hour and a half before showtime to make sure that the promoter had the right projector, screen and sound system. More often than not, one or more of those three components would either be broken or missing. So in addition to my own tape deck and film, I always carried tools and spare parts. That way I could usually jury-rig my way out of any problem. I also would clean the projector, which in many cases had not been cleaned since the year before—when I had done it myself. I knew I was in trouble one night at a high school auditorium in Pennsylvania when the promoter asked me to have dinner with him at 7 p.m. before an 8 o&apos;clock show. It was a real scramble, but by 7:45 when the promoter showed up with what was left of his six-pack I had everything ready. He quickly sold eight tickets for $1.50 each to the eight people waiting in line. Eight people to fill a 1,300-seat auditorium. I wandered into the parking lot to see if we should hold up the show for late arrivals. There were none. I was chatting with a policeman when an elderly lady strolled out of the darkness with her dog. She was the geometry teacher at the school and lived across the street. She had seen the lights and come over to find out what was going on. I invited her and her dog and the officer to see the show. Inside, I introduced myself to the eight people who had paid to see my latest ski film, starring Stein Eriksen, Christian Pravda and 8-year-old Jimmie Heuga. I invited them to come sit down front, then climbed on stage and talked to the 1,290 empty seats and the 10 full ones (not including the geometry teacher&apos;s dog). I told a few stories and then asked the janitor to turn out the lights while the 13-year-old projectionist turned on the projector. When the house lights went off, the projection room electricity did too. So during the next few minutes of total darkness I chatted with the 10 people in the audience—11 if you count the promoter who was popping the cap on the last remaining bottle in his six-pack. I thought about the advice I had been given in 1950, the year I showed my first ski film. On that occasion there were 37 people in the Sun Valley Opera House, a theater that seats 300. The old-time vaudeville performer who was running the theater gave me a bit of advice that would see me through a lot of the ups and downs of show business. I still think about that 50 years later. 1. Always entertain the people who show up, and feel sorry for the people who didn&apos;t.
2. You are going to work all your life to be a success…overnight.